"Can You Dig It?" is our latest Sunday Volleyball champion following a dominant playoff performance. They won both games in straight sets, which included a 21-8, 21-13 championship win over the #1 seed. 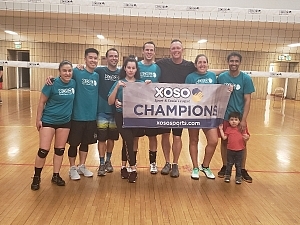 Prior to that they took down the "Black Panthers" who game them a run for their money in the 1st set, before our champs kicked it into gear with a 21-9 2nd set victory. Throughout the season they were a championship hopeful, especially after beating the defending champions in the first week of the season. From there they stayed hot, dropping just 1 match all season. In week 5 they even took on their eventual championship opponent, "Practice Safe Sets", taking home the 2-1 win. In total our champs finish with a 9-1 record, sitting atop the Sunday night standings. They also finished with a +16 set differential, doubling "Practice Safe Sets" who finished at +8. Congratulations to "Can You Dig It?" on the incredible season! Well done!